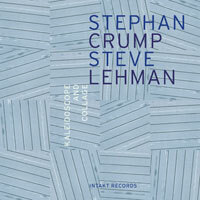 It's no critical hyperbole to say that Stephan Crump and Steve Lehman should be considered among the ranks of jazz's most exciting musicians. Crump's bass work with Vijay Iyer's trio adds a new depth to the way the bass can operate in the trio setting, going beyond accompaniment while adding some intense foundation work at the same time. Lehman's alto saxophone also cuts a new swath in groups like Fieldwork (which includes Iyer) and his own unit, which recorded one of 2009's most astounding releases Travail, Transformation and Flow. This meeting of the minds doesn't consist of written works, but it's also more than just two mutually compatible friends blowing freely. Crump and Lehman recorded together five times between February 2008 and December 2009. The fruits of those sessions have been diced up to create the two tracks on Kaleidoscope and Collage. So in a way, it's a combination of spontaneous improvisation and some cut-and-paste composition after the fact. It's likely that the original sessions would have been pretty interesting on their own, but this presentation keeps things moving forward, keeping some moments quick, letting others draw out a bit and occasionally cutting ideas off mid-thought, leaving you to wonder if your disc player decided to stick. The 22-minute "Terroir" introduces the duo's individual traits: Crump's rich tone and brawny bowing technique, Lehman's dry, occasionally rough tone, which sounds like it can be especially loud and edgy in person. Like his peer and occasional collaborator Rudresh Mahanthappa, Lehman has the tendency to unleash rapid sheets of complex melodies as if they were major scales. This piece finds Crump locking into riffs several times, albeit ones in odd time signatures. For one of them, he uses the body of his bass percussively, tapping out the beat. This doesn't make the track into groove music, especially since Lehman often charges against the ostinato, playing off of it rather than with it. While things get frenzied at various points, this never turns into a shrieking and slapping improv. The duo also stays on the more pensive side of freedom. "Voyages" runs a bit shorter, at 16 minutes. It's a little less dynamic but still has many fine moments. It opens with a minute or so of Lehman and Crump making it hard to distinguish who's bowing and who's growling into their horn. Instead of grooves, droning tone poems pop up a couple times, with one sounding like it could break into "In a Silent Way" at any point. When Lehman gently tongues one note over and over, while Crump plucks out a melody, it really does sound like a conversation, in this case one that feels like the opening stages of an argument. Although the edits are fairly easy to discern throughout the album, the cut after this particular moment is particularly prominent since this argumentative exchange suddenly stops and refocuses on Crump, now scraping his bow on the strings as Lehman emits some quick yelps. The end of "Voyages" feels like a written conclusion, which is also understated but feels like a bridge to bigger things. In some ways, it feels disappointing when it fades away, but that's also the sign of a good album. Besides, you must admire to improvisers who have the discipline to keep an album under 40 minutes, when they had twice that much time at their disposal.